A time to be the hands and feet of Jesus Christ in our community. We are excited to be hosting Feed the Ridge 2.0 again! We will be partnering with Feeding Tampa Bay to host a mobile pantry and pass out 10,000 lbs. of food to over 250 families. Our goal of $2,650 has been met! Anything in addition will be used for purchasing hygiene items for distribution. Don’t forget to grab some hygiene items and place them in the container beside the Feed the Ridge table in the church foyer. When giving, select or label as Feed the Ridge. Hunger and homelessness are right in our backyard. 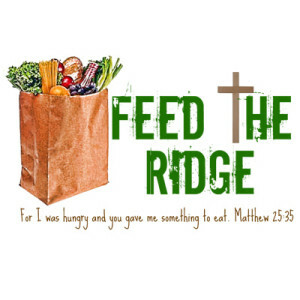 Make a difference – change a life – participate in Feed the Ridge. Together we can do more!